Around 1910, Ben and Nettie Morgan commissioned J.S. White to design and build a beach cabin on Whidbey Island. The story is told in the endearing memoir, “Down to Camp,” by Frances Wood, who is pictured above with the family cabin. Ben and Nettie purchased a lot in 1902 and around eight years later, commissioned White to build a cabin to replace their tent, a choice perhaps based on his association with Ben’s father. They christened the structure “Camp Illahee,” a word of the indigenous people carrying “a sense of home, and connections between people and living place,” according to Frances. 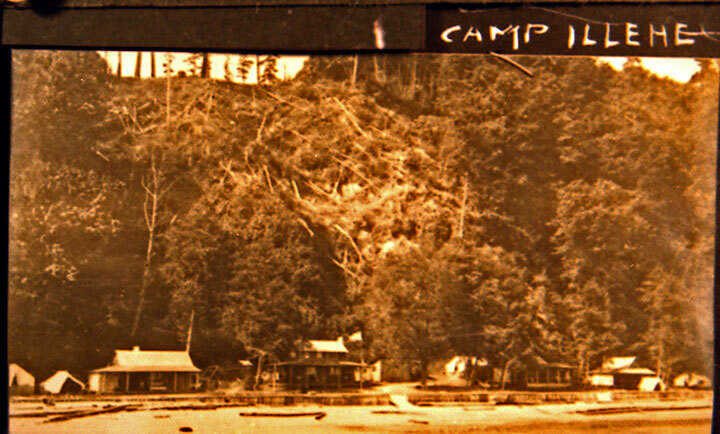 Camper’s Row on Whidbey Island, 1914, Camp Illahee is the cabin with the flag in the center, note tents to the left. The steep bank was vulnerable to land slides, as the one pictured here, and in 2015 a major slide left the historic cabin filled with mud. Three decades later, Frances tells us, her grandparents purchased Camp Illahee from Nettie, then married to a Taylor, who described the cabin in a letter: “… it could be rolled over and over and not come to pieces.” Regardless of this vivid pitch, Frances’s grandparents got the cabin for a low-ball offer of $1,100. 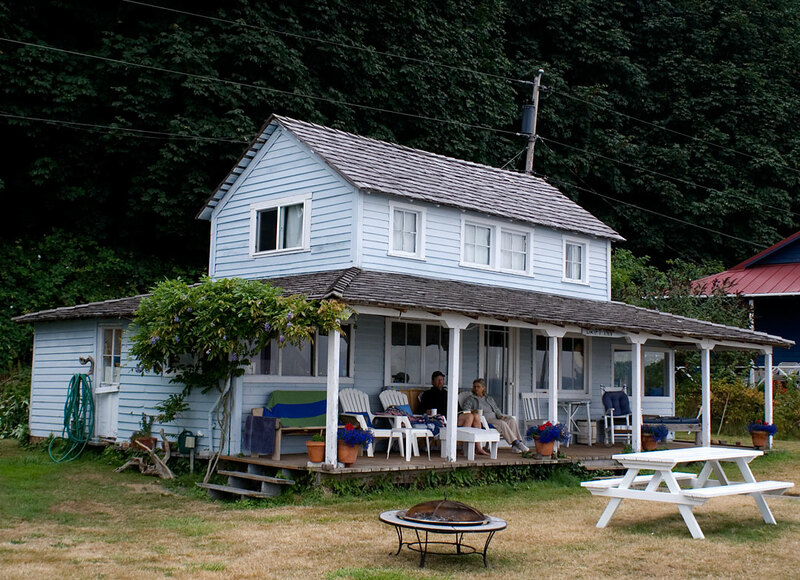 The cabin was renamed to “Drift Inn” by Frances’s parents when it was passed on to them. Fast forward through a childhood of summers spent at the beach cabin to the 1970s, when Frances and her sibling’s families are enjoying summer months at Drift Inn and the discussion of modifying the cabin comes up. The conversation involves three generations, including her grandmother Inez, the daughter of Nina and Charles Bakeman, who owned the furniture building that burned in 1893, sending the homeless city council members to White’s then-new building. In a telephone conversation, Frances shared with me the family lore that White was given the commission because he was down on his luck and needed the work. 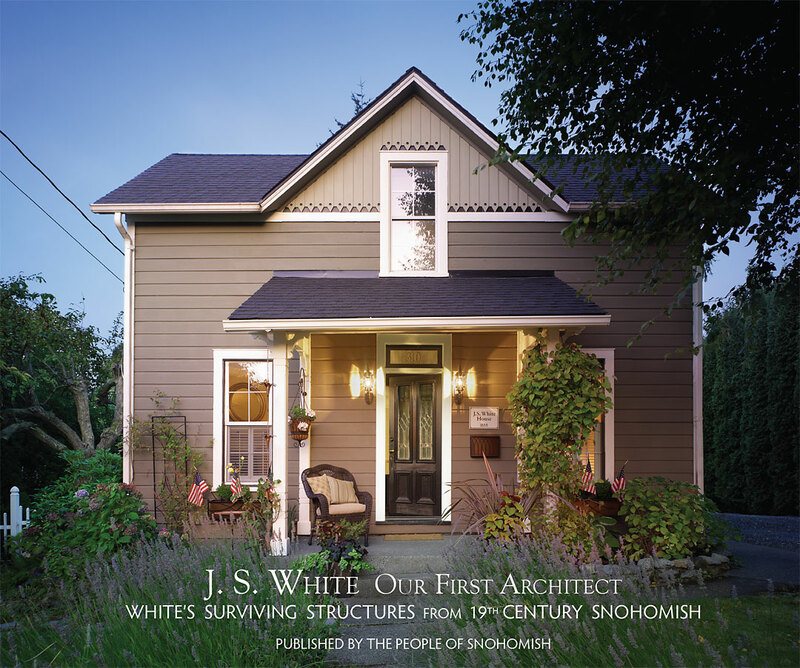 She also remembers Inez advising the grandchildren, when remodeling, to not change the “lines” because it was designed by the famous Snohomish architect, J. S. White. Pictured around the time of her marriage to Charles Sprau in the 1920s, this is the only known photograph of any member of the J.S. White family, that settled in Snohomish when Linnie was only eight years old. She was born in Topeka, Kansas, to Delia and John White as their first of three daughters. 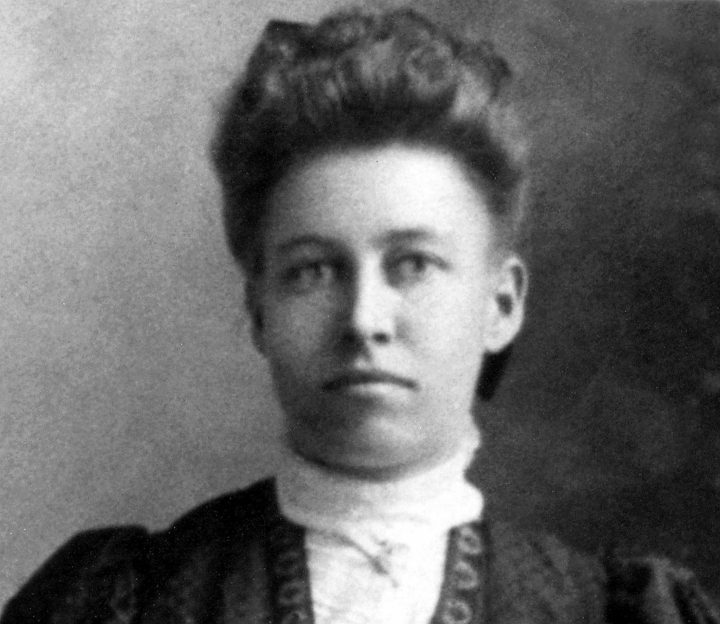 Alice White was born around 1879 and Elsie in 1882, both in Topeka, Kansas, as well. 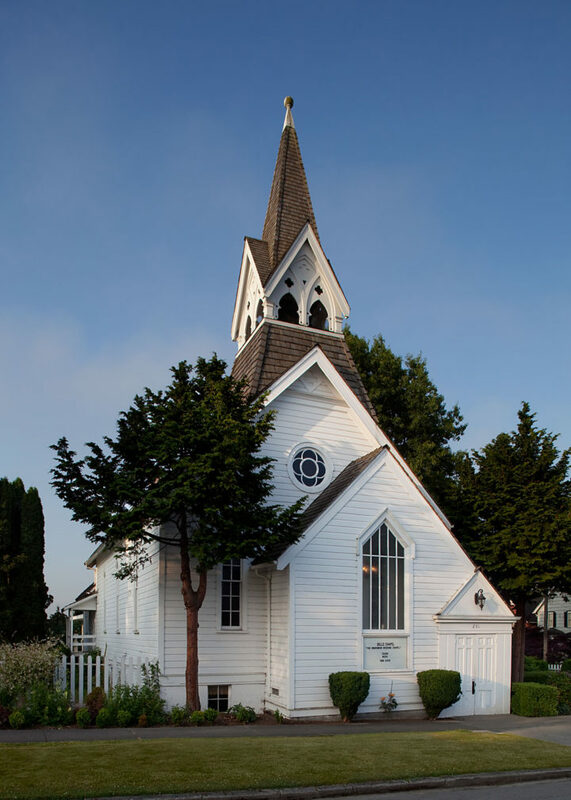 The family arrived in Snohomish in February, 1884, where it seems, John, as an architect and contractor, had a commission to build a church for a newly formed Methodist congregation where John and Delia served as trustees and remained members until their deaths. Linnie was one of four graduates of Snohomish High School in 1889, a year after moving into the family’s new home at 310 Avenue H. She worked as a bookkeeper for the popular grocery store Bruhn & Henry. In 1906, Linnie married Charles Sprau and the 1920 Census recorded the couple living on a fruit farm in Chelan County, Washington. They did not have children. Ten years later, the census showed Linnie living with her mother in the family home on Avenue H, while her husband was lodging across town. Apparently she was ill and her mother was caring for her. Linnie died in 1930, ten years after her father, who also died at home. Linnie was buried on the 13th of May at Woodlawn Cemetery alongside her sisters Alice, who died in 1898, and Elise, 1928. The White graves at Woodlawn Cemetery. On March 6, 1933, Delia White passed and was laid to rest with her daughters in a spot high on the hill overlooking the Snohomish River. John was cremated in Seattle and the location of his remains are not known but our imagination has the family members together again. 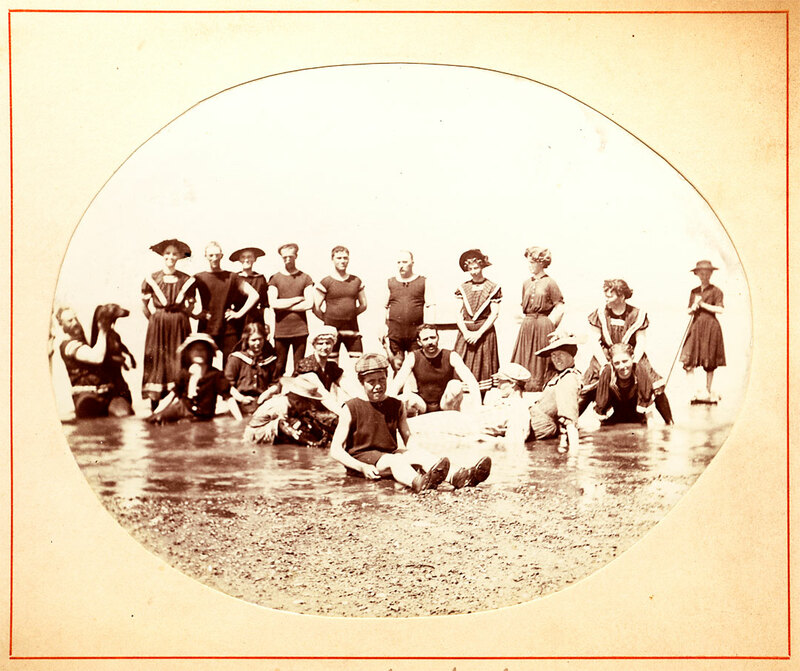 Thanks to our favorite genealogist, Ann Tuohy, for her workup of the White Family; and to Dave Sprau for the photograph that included Linnie in a multi-family pose. Working on the first essay of the J.S. 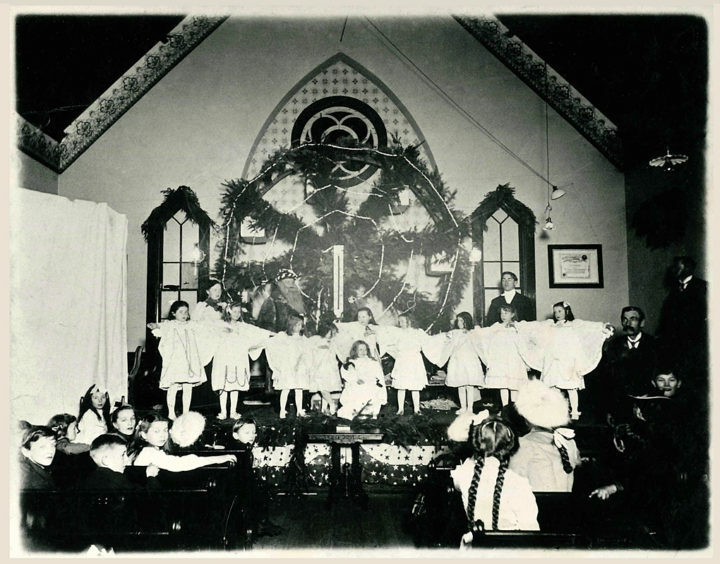 White Story this past month, it appears that John and his wife Delia, along with their three daughters, Linnie, Alice and Elise, moved to Snohomish specifically to build the newly formed Methodist Congregation its own church. Further digging revealed that joining the Whites as Trustees of the new church, were Mr. and Mrs. Mudgett; and, Isaac Mudgett was born in the same New Hampshire town as John White. The Mudgetts arrived in town in 1883 and within two years they had a home in the Clay Addition on Avenue H, just a few doors North from where the White’s would build their family home. Isaac was a bootmaker by trade, but once settled in the Snohomish Valley, he added his own saw mill to the cluster of small, family run operations around Snohomish. Without the exchange of letters between Isaac and John, we are left with our imagination to make the connection. But it’s also a matter of common sense to think that White had a promise of work before moving his family and household goods to this remote river front town. THEN: The Methodist and Catholic churches along Third Street photographed by Index resident Lee Pickett in 1910, just before the Methodists moved their church higher on the hill to its current location. 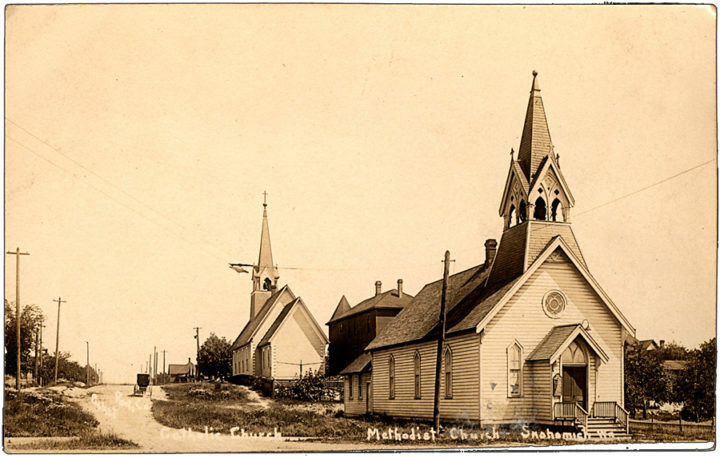 The Methodist’s built the second church in Snohomish in 1885; and the Catholic Church was the third, dedicated in 1889. NOW: (Above) Looking west down Third with the Methodist Church on the corner of Avenue B. Architectural photographer Otto Greule is capturing the structure for our book project: J. S. White: Our First Architect, in 2009. Karen and I renovated the former St Michael Catholic Church between the years of 1994 and 2000, when we moved to Snohomish. Several times we were told the story that the Methodists’ moved their church from Avenue C, up the hill, to B because they wanted to be higher than the Catholics. We laughed and got back to work. Can you imagine that being the reason given in the church’s history, published in 1983, celebrating 100 years? Of course not. It was because more room was needed to add a Sunday School and three lots on the southeast corner of Avenue B and Third were purchased in 1908. Two years later, White’s gentle structure was indeed moved uphill and placed on top of a full, concrete basement, that eventually included a kitchen. Church membership numbered around 200 at the time. It served well until the 1980s, when it was clear that the historic structure was too small and five acres were purchased northwest of Blackman Lake. The 1983 account ends with completion of architectural plans for the new church — their current home. 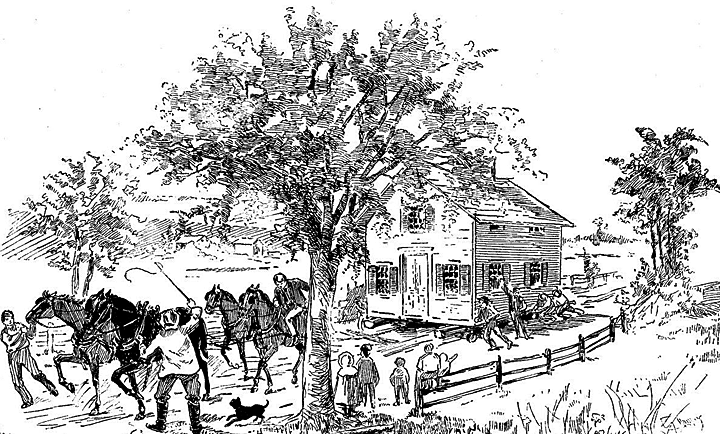 Captured from the internet in a search for “moving structures with horses.” Note the dirt path that was 3rd Street in the historic photo above — it was labeled “not fit for teams” on the Sanborn Insurance maps — meaning that it would be a tough go for the Fire Department horses pulling the pump and hoses! 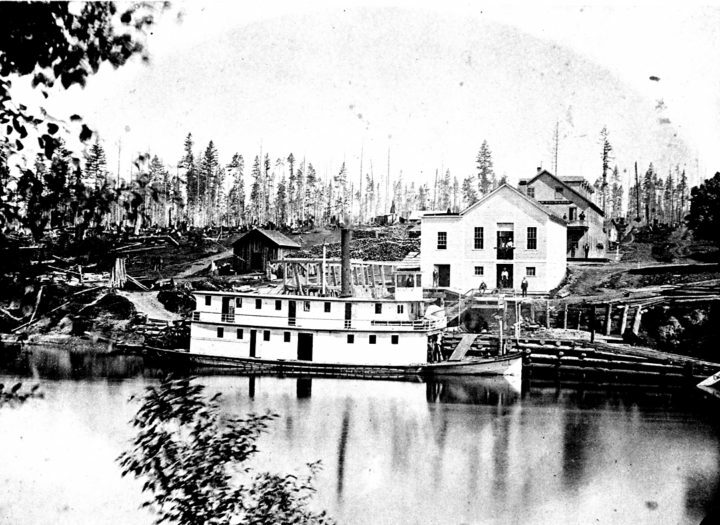 Above: Stern-wheeler Nellie at Ferguson’s Wharf, 1877. The building behind Ferguson’s is Cathcart’s Exchange Hotel; and, the dirt path to the right is Avenue D — much improved by the the time the White family arrived seven years later. John S. White arrived in Snohomish aboard a slow steamer followed by a weak wake of records going back to his birth on July 13, 1845, in the small town of Tamworth, New Hampshire. The 1870 Census recorded White living in Walnut, Butler County, Kansas, age 25, single, working as a house carpenter and living in a hotel kept by his future wife’s brother, Charles Lamb. January 1871, John S. White married Delia R. Lamb, daughter of Galand Lamb and Lucy Weston, in Kansas. 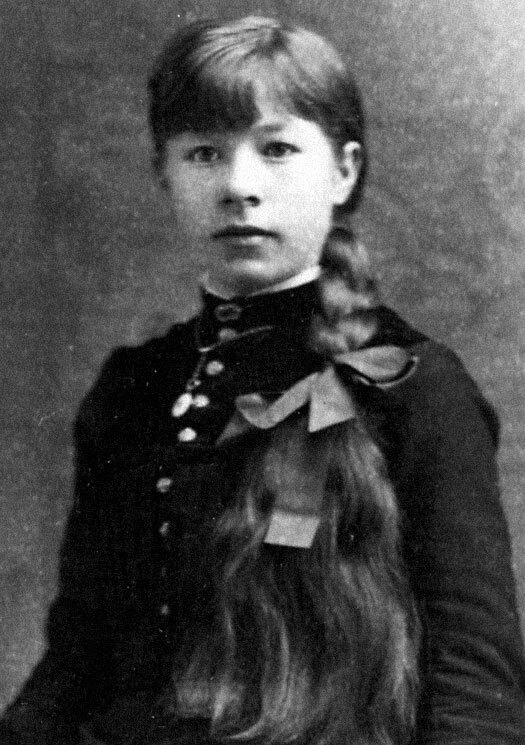 Delia was born about 1853 in Fort Wayne, Allen County, Indiana. The 1880 Census listed John, his wife Delia and daughters Linnie and Alice living in Topeka, Shawnee County, Kansas, where he was a carpenter. White’s young family, now including a third daughter, Elise, disembarks from the steamer by way of a precarious plank connecting the ship to the wharf. There, Delia huddles with her daughters, watching, as the picturesque tableau of people who were waiting for the steamer is now animated and it’s chaos. People shouting, dogs barking, horse-drawn buggies and carts jockeying for a position to load, and operators of a dozen Indian canoes jockey for a job hauling the Boston’s cargo. The stack of household trunks and packages that John has assembled behind his family is beyond our imagination. Still, they stand, watching, frozen — for an instant, they are a living monument to evidence that there is life outside Snohomish. The White’s new home town is a self-sustaining settlement sited in the sunshine on the south-facing bank of the river that gave this place its name. Located some dozen miles upriver from its fast growing rival, the port city of Everett on Port Gardner Bay to the west; but in February, 1884, Snohomish is not only the county seat, but it’s also home to two roller skating rinks. Above: J.S. White’s Family Home. Built in 1888 at 310 Avenue H, John S. White, and his wife Delia (Lamb), raised their family of three daughters in this modest home. White died here on October 17, 1920, following a long illness. Seattle photographer Otto Greule captured this storybook image early one morning in 2011. 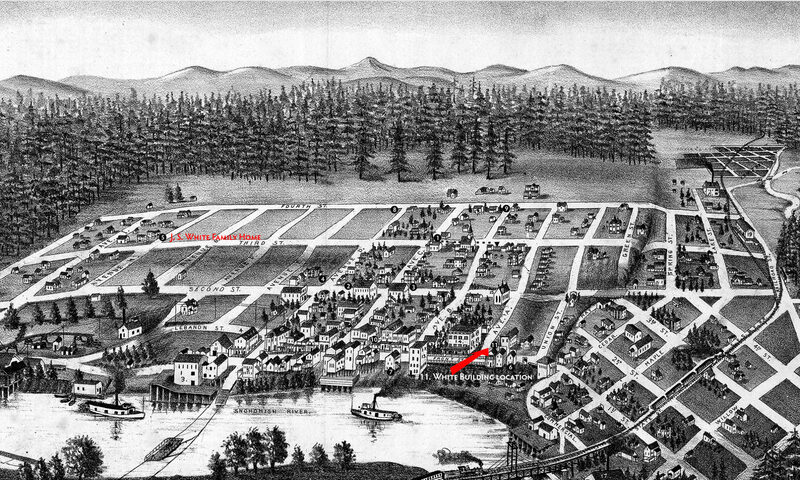 Looking at the 1890 bird’s-eye illustration below, it could be said that all of Snohomish was built without permits. There are no construction records from this time. Only the sale and purchase of the property was recorded in General Indexes maintained by the County Auditor. A researcher has to turn to the gossip pages of the early newspapers to learn who was building what for whom. Fortunately for this researcher, my historic person of interest, J.S. White, was a busy architect/builder of businesses and homes for the leaders of early Snohomish, and his doings were noted in The Eye and later in the Snohomish County Tribune. A little background is required to appreciate the editor’s jibe. Bird’s Eye View of Snohomish, 1888. Legally known as the Clay Addition, Claytown shows up in the bird’s-eye view above as the cluster of homes on the left-hand side. The undeveloped eight-block area between Avenues H and D is Ferguson’s 2nd Addition – lots that he was planning on selling at higher prices, it seems, once railroad travel was established in Snohomish. 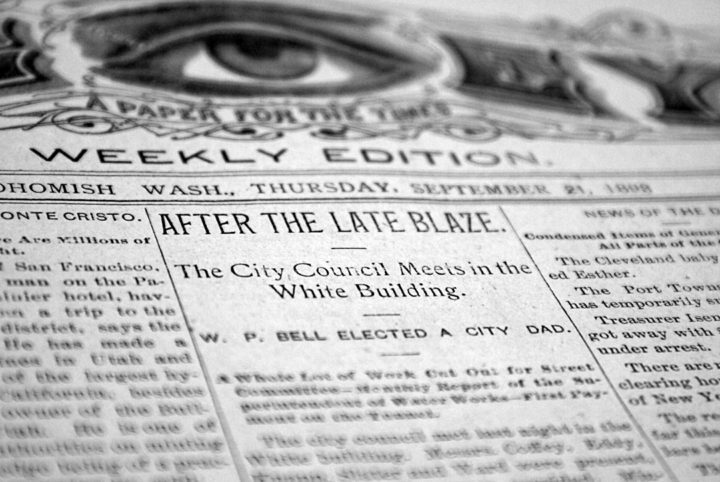 The “Eye Man” as the editor of The Eye referred to himself, rarely missed an opportunity to remind readers of the workings inside Ferguson’s Snohomish Land Company. But it’s the picture created of White walking through Ferguson’s empty lots, on a moonless night, (some council meetings stretched to midnight), enclosed by a flickering aura of bobbing lantern light, that captures the imagination. And it’s on this note that the printed version of this column will end. 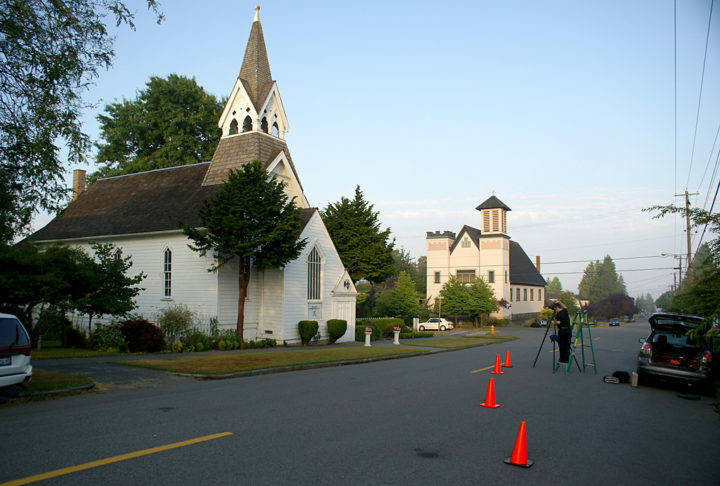 “Snohomish Then and Now” began publishing in the Tribune, January 2007. I appreciate the publisher and editor’s support for sharing the photos and stories of Snohomish’s then-and-now over the past seven years. Snohomish Stories will continue here with excerpts from the book I will be writing about J. S. White. My goal is for the words to match the quality of Otto Greule’s portraits of White’s surviving structures from 19th Century Snohomish. Otto’s work will be featured in an exhibition at our library for the month of October 2014. Please save the Thursday evenings of October 2nd and 23rd for presentations by David Dilgard and Otto Greule respectfully. David is our favorite carpetbagger, as he refers to himself, from the Everett Public Library’s Northwest Room, who travels frequently upriver with his magic lantern, showing and telling stories of our city’s beginnings. 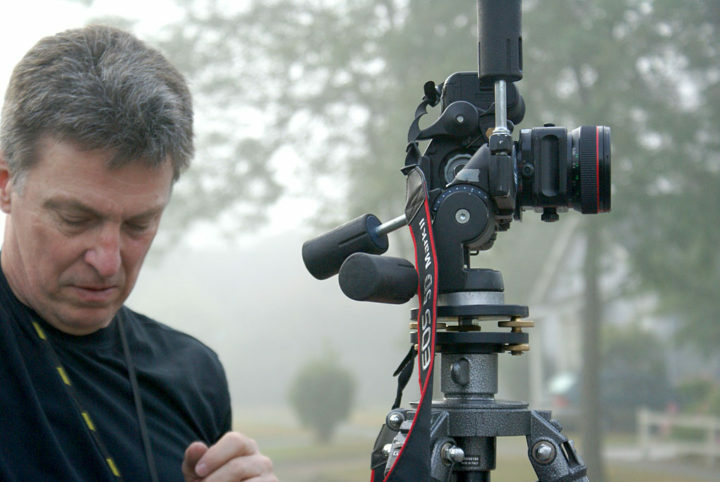 And on the 23rd, also at 7p., Otto will give a presentation about his process of photographing White’s structures. Wrapping up the month-long exhibition, I will lead a 90-minute walking tour of J.S. White’s 19th Century Snohomish, on Sunday, October 26, leaving from the Snohomish Library Branch on Maple Avenue at 2p. sharp. The Building That Stopped a Fire! 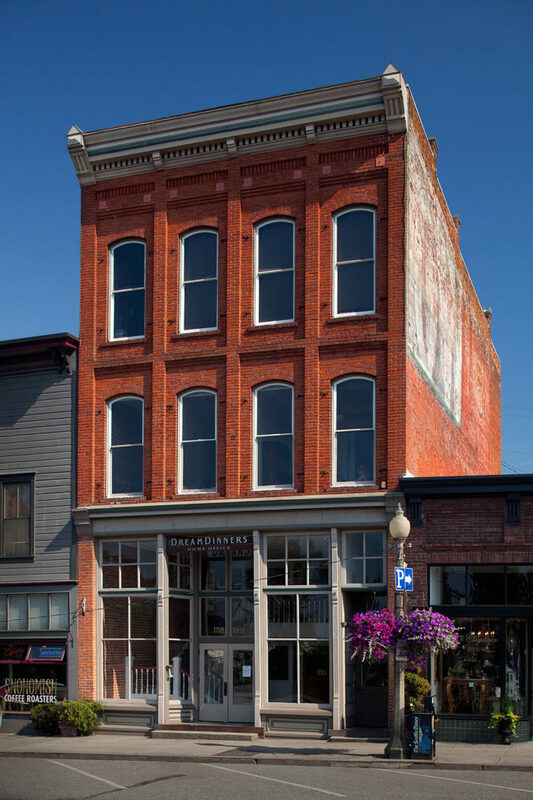 Meticulously captured by photographer Otto Greule for our project documenting architect White’s surviving structures from 19th-century Snohomish, the Burns Block (1118 First Street) bears the historic name of its eccentric owner, Samuel John Burns. Knowing this, you have to wonder about Burns’ relationship with his architect/contractor J. S. White … a little gossip would help my story just about now. In any event, their collaboration resulted in Snohomish’s grandest building, and a hero, as well, if a building can play that role. 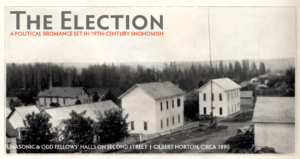 It was the great Snohomish fire of 1911, when in the middle of the night, the wooden buildings on both sides of First Street, starting near Avenue B, were fully engaged in flames and smoke. On the south side of First, the fire burned the wooden buildings built on pilings until it ran out of fuel at the intersection of Avenue C.
Across the street, however, the fire’s raging westward movement was stopped by the three-story-tall Burns Block acting as a firewall. This story was one of the favorites told on our tour with Emerson third graders this past May, judging by their thank you notes. 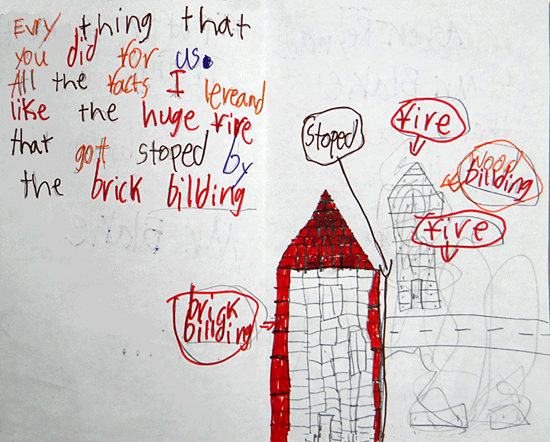 Thank You note from an Emerson third grader for leading a walking tour in May 2014. The building is related to fire from another direction, as well. In 1889, the older, waterfront part of Seattle burned to the ground started by the infamous glue pot. The lesson taken from that disaster, which the Snohomish Fire Department helped fight, was that all commercial building would be built of brick. And the Burns Block is built of bricks manufactured in Snohomish! Today, our grandest building wears its red bricks as many badges of courage, standing tall in the afternoon sun. As for the miser Burns, who listed himself as a “capitalist” in the 1888 Polk Directory, he died at age 66. 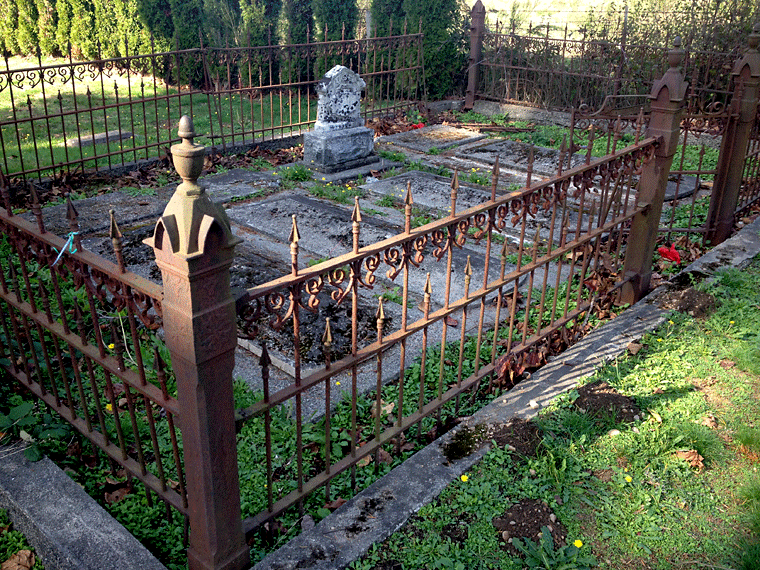 A single man, his body was returned to New Brunswick, Canada for burial in the family plot. His extensive real-estate holdings in Snohomish were divided among his six siblings. 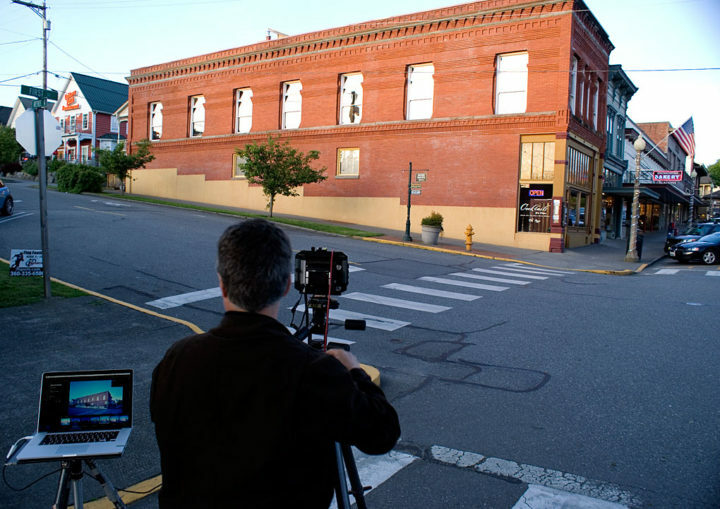 The graceful red brick building at 924 First Street was called the Princess Theater Building when I led my first walking tour of historic downtown Snohomish in 2005. Six years later I went digging for more news about the Princess Theater for a HistoryLink.org Cybertour, and came up surprisingly empty handed. Surprising because who ever heard of a theater that didn’t advertise? The Princess Theater. 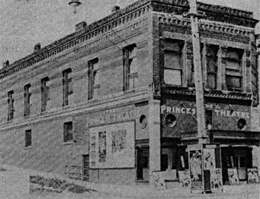 This fuzzy image included on page 46 of the Snohomish Historical Society’s “River Reflections, Volume One,” published in 1975, evidently gave the building at 924 First Street its name over the years although no record has been found of the theater’s life in Snohomish; nor a better photograph. But no follow up and no building appears on the Sanborn Insurance maps? Three years later, in the December 22, 1892 issue, a news item jumps out announcing that White’s corner lot is being graded for a shooting gallery! The plot thickens whenever guns are involved. Picture a barge floating low, loaded down with stone coming upriver. 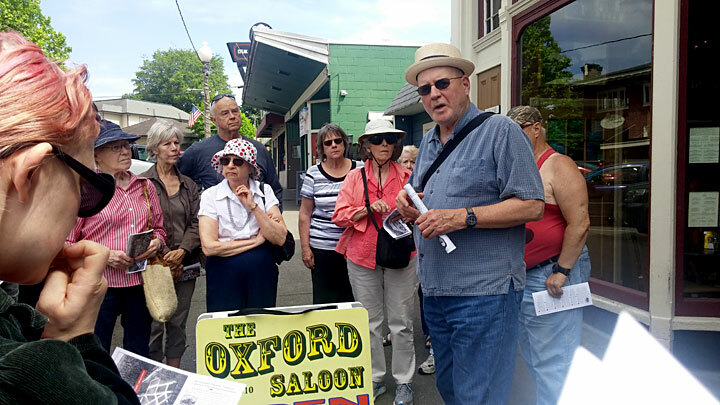 The following month, an issue over property lines was raised in the City Council Chambers by White’s attorney Hart who claimed that the Palace Saloon, next door, was four inches over its property line and asked the council to have it removed. “The council were not convinced of their duty to do so and instructed Mr. Carothers to survey First street from D to A and fix the corners,” the report concluded. A subsequent meeting recorded the numbers without determination if the saloon was over the line. In a plot twist from the pages of a mystery, the new Bakeman Furniture Building, just down the street on the southeast corner of Avenue B, burns to the ground on September 15, 1893, following an unsuccessful incendiary incident in July. No loss of life reported, but the city council lost its meeting place. The editor showed restraint with no mention of how fitting it was for our council members to be meeting in a hospital.